March | 2014 | Whatcha Thinkin'? Get off your pockets…someone needs you! What comes to your mind when someone says they are going to church? What do you think of when someone says they are part of a local church? What do you think that looks like? If someone said they were looking for community what images would come to mind? A few weeks ago I posted about how God was reshaping my views of community. You can read that post here. Today He continued to show me what His Kingdom looks like operating outside the walls of a church building. Today it looked like a phone call from a friend who shared a message from the heart of God with me that helped me climb down out of a tree of angst I had willingly climbed up in and needed a way down. Today it looked like a friend who cared enough to take time out of her day to guide me thru an important conversation I needed to have with God. A conversation that led to some important healing of my soul and revelation of who He is. Today it looked like rejoicing with a few friends who recognize that God is bigger than any box we try to fit him in. Rejoicing that we are all on a journey towards more of him. Today it looked like a friend who recognized something deeper than a status update and took the time to check in. Today it looked like a whole bunch of friends being the hands and feet and mouth of God outside man-made walls. I believe in the local church. I think it’s important to get plugged in and serving with a group of Christians you can do life with. I think it’s important to have a group of people you can worship and serve with who can give you a place of accountability. I think it’s important to have fun with a group of like-minded people. I know each one of the people I mentioned today thru my involvement in a local church even though we don’t all attend the same one on Sunday mornings. BUT…in order to do the work God had for them to do in the Kingdom, they had to leave the building. In order to be part of God’s plan, they had to leave the pews and roll up their sleeves. They had to put the things they heard and believe to work in their daily life. They had to choose to actually do something besides listen to a sermon or attend a bible study or send someone to talk to their preacher. THEY were the hands and feet! That is community and it doesn’t happen with your pockets firmly planted in a pew on Sunday morning. Thank you friends for being His hands and feet. Thank you Lord for sending these peeps into my life to speak on your behalf! A few weeks ago I told one of the other softball moms that it was really a good thing that I was doing this softball mom thing in my mid 40’s instead of my mid 20’s. I think God knew what he was doing when he had me wait to get married and then to have kids. Well, like He doesn’t ALWAYS know what he is doing. My competitive 20-something year old self would not have been able to keep her mouth shut during a blown call or a missed play. My competitive 20-something year old self would not have enjoyed a weekend of losses. Yes, I would love to see these girls win, don’t get me wrong. It was a lot more fun watching the games they were actually competitive in than the ones that they barely played with their eyes open. But I can honestly say this was a great weekend even though we didn’t win a single game. Why was a softball tournament weekend without a single mark in the win column fun? Because I got to see things like this all weekend! 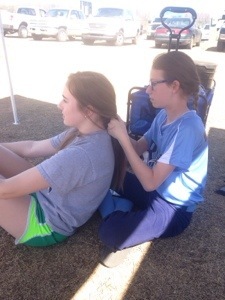 It was great to watch Gracie braiding her big sister’s hair. It was great to watch Emily supporting her sister all weekend. It was great to watch the two of them head off together to watch other teams play during the breaks. It was great to eat out with the family and listen to the conversations and laughter about the weekend’s events. Everyone supported each other this weekend. Just like a family should. Yes, I’m ready to see our girls hit the win column. I have no doubt that day is coming soon! If you come here looking for a new post and don’t find one, I am probably sitting on a bleacher somewhere looking at this. You might think that would give me plenty of blogging material and it may one day. Today it has just drained every creative thought from my mind. I’ll be sitting in the same spot tomorrow so maybe I’ll come up with something before you come back. If not, I was reminded by Sparky that a photo and a sentence counts in the blog challenge world, so you may just get to see more of these views for the next several months…years. Thanks for the cool shot Emily!